RIR's Gleb Federov traces the history of the religion in Russia from its origins till the Soviet days. 1) What type of Buddhism is found in Russia? Tibetan Buddhism is practiced in Russia. It is found mainly in three regions: Buryatia, Kalmykia and Tuva. Buddhism first came to Russia in the 17th century, when the western Mongolian nomadic Oirat tribes, which were then known as the Kalmuks, arrived at the lower reaches of the Volga, and in the mid-17th century during the conquest of Transbaikalia, the area east of Lake Baikal where the eastern Mongolian tribes, the Buryats, lived. Around 1616, en route to the Volga, the Oirats built their first fixed monastery, Darkhan-Dorzhan-kit (“Seven Chambers”), in the vicinity of the modern-day city of Semipalatinsk in Kazakhstan. 2) When was Buddhism recognized? Two and a half centuries ago, the empress Catherine II (the Great) allowed Buddhists to choose their own leader—Pandito Khambo Lama. Until then, all Buddhists in Russia had obeyed the Mongolian or Tibetan hierarchies. As a token of gratitude, in 1766 the Buddhists recognized Catherine as the earthly incarnation of the White Tara (a Buddhist goddess). Buddhists lived peacefully not only under Catherine, but under all the Russian monarchs. The current leader of the Russian Buddhists is the 24th Pandito Khambo Lama. 3) Who was Nicholas II’s Buddhist physician? One item mentioned in connection with the influence of Buddhists in tsarist Russia is that Peter Badmayev, who was originally from Buryatia, treated Nicholas II. Badmayev himself was not a Buddhist, but he came from a Buddhist family, and his elder brother was Alexander Badmayev, a doctor of Tibetan medicine whose skills so impressed Alexander II that the tsar allowed him to practice in St. Petersburg. In Petersburg, to where he moved following in his brother’s footsteps, Peter converted to Orthodoxy after he became Alexander III’s godson and trained as an Orientalist and doctor. He served for many years in the Asia department of the Ministry of Foreign Affairs. He then worked as a physician from 1875 to the end of his life. The members of the royal family were among his patients. 4) How did Buddhists affect the formation of Russia’s territory? During his diplomatic career, Peter Badmayev tried to convince the Russian tsars to incorporate Tibet, Mongolia and China into Russia. Nicholas II called the plans fantastical, but they were partly fulfilled. After the fall of the Chinese monarchy in 1911, Russia annexed Tuva—the third Buddhist region in Russia after Buryatia and Kalmykia. The annexation was not violent insofar as it was supported by the republic’s clergy. Interestingly, to this day Taiwan lays claim to this territory, considering itself the successor to Qing China. 5) Where in Russia did the 13th Dalai Lama want to hide? 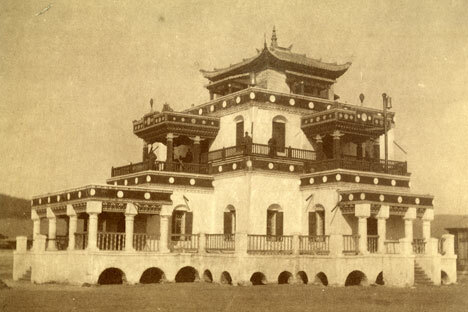 According to one version of events, the 13th Dalai Lama blessed the construction of a temple in St. Petersburg (it was built in 1915), presuming that he would take refuge there if British forces invaded Tibet. However, revolution then broke out in Russia, followed by the Civil War. The communists maintained ties with the Dalai Lama for some time, hoping for his help in bringing a worldwide revolution to the Buddhist east, but these hopes were soon dashed. 6) What was the Petersburg temple used for during the 20th century? The Petersburg temple has now been returned to the Buddhist community, but over the course of the 20th century, the building was used for numerous purposes. During the Cold War, it held equipment that created interference in Western radio programs that were broadcast in the Soviet Union. In 1962 the temple was given to the Zoological Institute of the Russian Academy of Sciences to house the Museum of Functional Morphology and several laboratories. The building did not come under government protection until 1970. The Dalai Lama nonetheless visited this temple—but it was the 14th Dalai Lama, not the 13th, who arrived on a gray September day in 1987. Eyewitnesses to the Dalai Lama’s visit recount that on that day, a rainbow unexpectedly appeared over the Hotel Leningrad, where he was staying.